Chicken paprikash is a meal I grew up with. Half my ancestry is Hungarian, with those relatives having settled in New Jersey right off the boat. We would have a big bowl of this dish with a pile of poppy seeded Kaiser rolls from the City Bakery in New Brunswick. That bakery is long gone but we would bring large garbage bags of those rolls back with us to be frozen and enjoyed until the next time we would make the six hour trek out to visit. 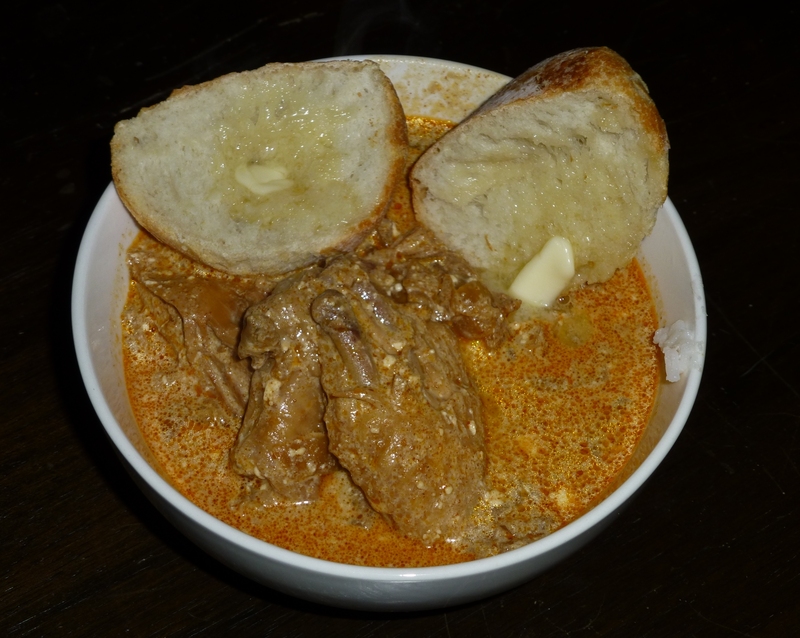 My family’s version of chicken paprikash seems to be a little different than some I’ve seen. We seem to use quite a bit more sour cream than a lot of them, which only seem to use sour cream as a garnish. But the basic elements are there. Take butter and melt in pot. Add onions and salt, cook until translucent. Add chicken pieces and water. Braise 20 minutes. Add paprika and then braise until chicken breasts can be pulled apart with a fork. This means the other parts will also be falling apart. My family would leave the chicken parts in the liquid, but you can pull out the parts, remove the meat and add it back in, throwing away the skin and bones. 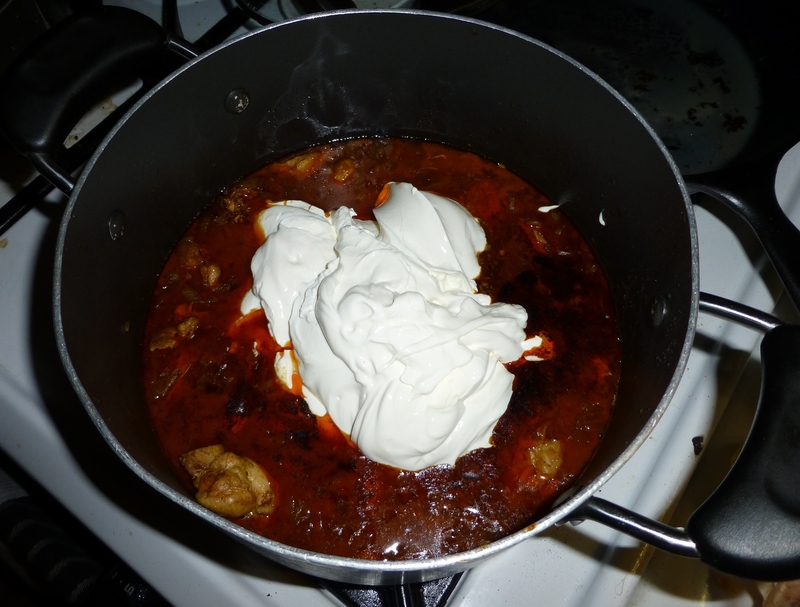 For me, it isn’t real paprikash if it doesn’t have the soft skin in amongst the bits of meat. You could also let the liquid reduce if you want a thicker sauce. I like it more toward soup in thickness rather than stew. Add all of the sour cream, stir in and heat through. Serve with crusty rolls and rice. The rolls in the photo are heat and serve from the frozen foods department. Now from the bar. I had wanted to try another French wine just to be sure that I really didn’t like them. The ones I had so far were thin, acidic and just nothing I wanted to drink. Upon a visit to the state store (Pennsylvania has a state liquor store system), I found Arrogant Frog Pinot Noir on sale. For 8 bucks a bottle on sale, it was a great value. Beware, once off the front page of the website, there is autoplay music (a great annoyance to me). It is definitely a more new world style of wine, a lot of fruit, though it is quite dry. The new beer for this week is Sam Adam’s Merry Maker, one of their limited edition offerings. It’s a gingerbread stout and I very much like it. The appearance is a dark stout with a crema of dark foam that lingers on the glass. Surprisingly, this isn’t sweet, at least not when I hold my nose and just allow the taste buds their say. The aroma is very sweet seeming, much molasses and ginger. It comes in a 22 oz bottle and has a relatively high alcohol content at 9%. I would indeed get this again. I think it would be great after a day of cold-weather activities. That’s it for now. Eat, and drink, well!